When sanitation pipes break, or they don’t exist at all, the Pee-Poo solution could alleviate risks from faecal pollution in the Middle East. “Flying toilets” are common in slums worldwide: Residents unable to reach a latrine due to crowding, distance or insecurity, defecate in a plastic bag and then sling it over the rooftops. But in Haiti, aid teams are testing a specially treated bag designed to turn human faeces into compost within weeks. This solution could work in Gaza, and other Middle East regions where sanitation is poor, and infrastructure limited. Covered extensively on Green Prophet, this is the first time the new Pee-Poo bags are being tested in a post-disaster humanitarian response, according to Andy Bastable, public health engineering coordinator with Oxfam, which is evaluating the product at settlements of displaced people in the Delmas area of the capital, Port-au-Prince. 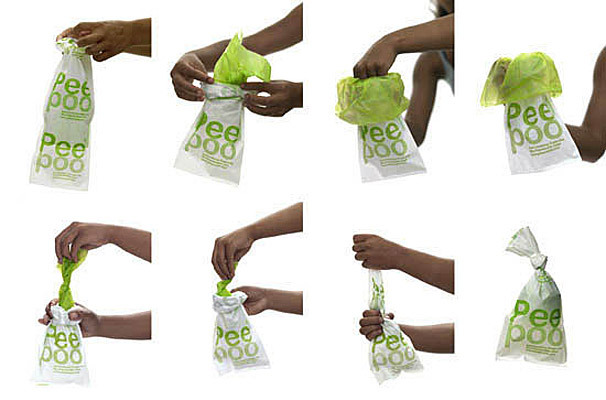 To date the Peepoo, which includes a chemical to break down waste for use as fertilizer, has been used in slum areas in Bangladesh and Kenya. Critics of the approach say by itself it does not resolve issues of privacy or hand-washing – essential in sanitation solutions – and there is no consumer incentive to use the bag. An NGO project director working in urban sanitation who preferred anonymity said while the potential benefits are there in general public health terms, for the individual who can use any plastic bag for free it makes no difference. The aid worker, whose work includes sanitation interventions in Nairobi’s largest slum, Kibera, said the product was “a lovely idea” but “a bit of a joke”. At some sites where displaced people are living in Port-au-Prince, pit latrines commonly used in post-emergency situations are not feasible because of concrete or tarmac surfaces, a high water table or landowners prohibiting the digging, Oxfam’s Bastable told IRIN. One option in such settings is raised latrines, but US$20 per day per toilet to desludge gets quite expensive, and truck access to many of the sites is difficult, he said. For many in Port-au-Prince the odour-neutralizing bags, with gender-segregated stalls, hand-washing stations and bins regularly emptied by aid workers, are an improvement. Sanitation conditions were poor in Port-au-Prince before the 12 January earthquake and many people defecated in plastic bags, dumping them wherever they could. Camilla Wirseen, Peepoo project director and one of the founders, said while Haiti is no longer in the initial response phase, Peepoo trials in Port-au-Prince will give useful information about the viability of the method in disaster response settings. This could work in refugee camps and other distressed and developing areas in the Middle East. Next Next post: Masdar City: Small Hiccups, Or Total System Failure?